There are few better birthday presents than a near guarantee that the next 10 years should be momentously better than the first 10. Spring Airlines marked its 10th anniversary on 18-Jul-2015, having amassed a fleet of 50 A320s and passenger volume of 11.5 million in 2014. 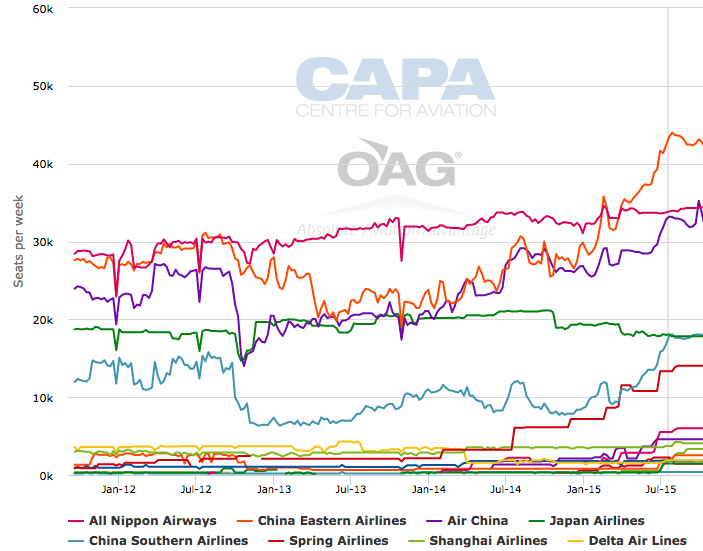 Spring is China's most notable low-cost carrier, yet even these figures represent under-achievement in terms of what should be possible. This is scarcely the fault of Spring, which planned for 100 aircraft in 2015 but was repeatedly held back by regulator CAAC. 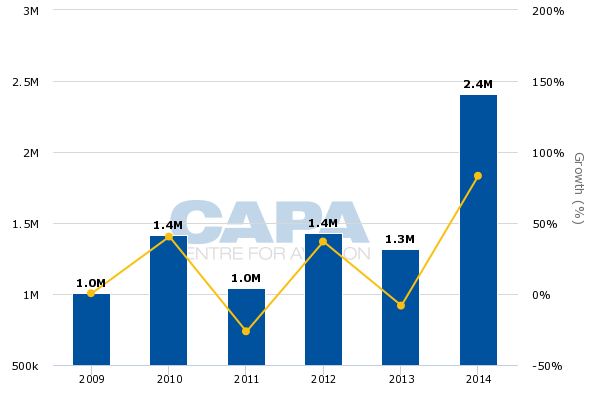 Now the CAAC holds Spring up as a model for efficiency and success, and is welcoming other local LCCs. Foreign carriers are increasingly taking note of Spring's practices as it has the strongest low cost position in what will soon be the world's largest market. Spring has received approval to double its fleet to 100 aircraft in 2018. The next few years will be characterised by increased international operations: Spring plans to end 2015 with 30% of seat capacity in international markets, up from about 15% in 2014. This comes as the CAAC pushes for international growth and Spring feels emboldened, having finally successfully completed its IPO. Spring has opened bases around Japan and Korea to allow it to link foreign cities with more Chinese cities than if it relied only on local Chinese bases. Recent traffic rights to Taipei and Tokyo Haneda are modest victories but loom large in significance. Seoul awaits as the next large market – and after that, probably long-haul services. Spring Airlines turns 10 with a fleet of 50 A320s. 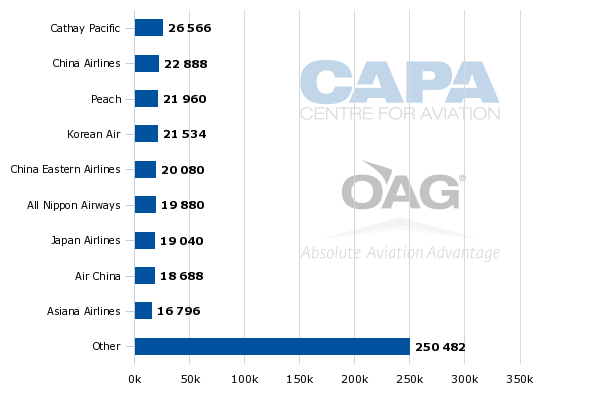 Spring had planned a fleet of 100 in 2015 but had to reduce this as the CAAC did not give approval, effectively to protect the incumbent state-owned carriers. Spring and other private carriers have at times had aircraft ready for delivery into China but delayed for months. It is valuable to compare Spring's fleet growth to a select group of other major LCCs that have launched (or in the case of AirAsia, re-launched) since 2000. Wizz Air marked 10 years with 46 aircraft while Malaysia AirAsia amassed 53 aircraft and Jetstar Australia 59 – and all three operate in markets a fraction the size of China. Notes: Excludes widebody aircraft. AirAsia from 2001. JetBlue: average aircraft per year. 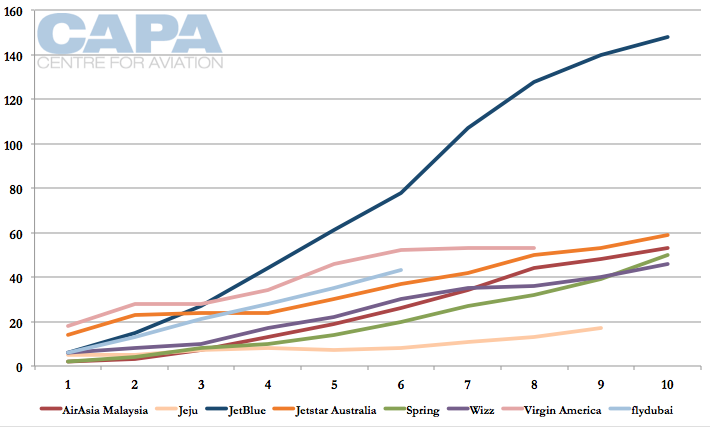 Jetstar: based on fleet to 30-Jun in each year. In a more equal comparison for market size (and not necessarily transparency), Virgin America reached 50 aircraft in six years (although this may have been too much capacity for it) while JetBlue hit 50 after around five years. flydubai is expected to reach 50 aircraft in seven years. Korea's Jeju Air, which battles traffic rights and Korean government protectionism, will operate about 20 aircraft as it turns 10. Spring has received approval to grow to 100 aircraft in 2018. After taking 50 aircraft in 10 years, Spring will take its next 50 over 3.5 years. But this too is a compromise, and Spring would have liked to have more than 100 aircraft in 2018. Spring's fleet at end-2015 could be as high as 60. Spring will start to receive Airbus' new configuration in the A320 that allows for an extra six seats, bringing capacity to 186. Spring is the launch customer in China for this. 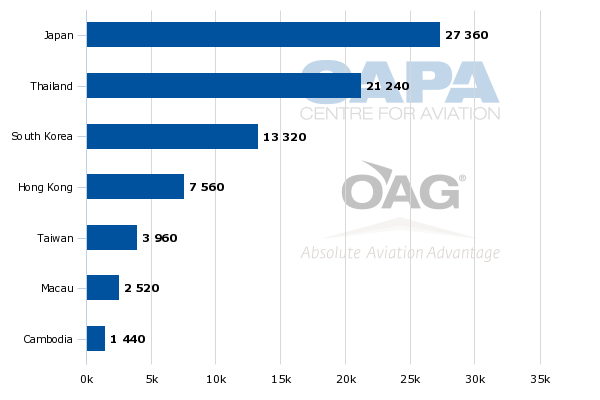 Spring's average fleet age is 3.2 years, according to CAPA's Fleet Database. There are no aircraft officially on order, although Spring disclosed in late-2013 it was negotiating for 30 aircraft, a mixture of A320ceos and A320neos. That figure will likely be revised upwards. Depending on regulatory support, Spring could make an order on the magnitude of other LCC orders that have grabbed headlines. 9 Air, a Guangzhou-based LCC that commenced services in Jan-2015, was able to make a commitment for 50 aircraft – more than Spring ever has at one time, indicating Spring's order could surpass that figure in the new environment. Spring's Chinese operation only flies the A320 while its Japanese unit, still in the start-up phase, has a handful of 737-800s that were received new. Spring carried 11.45m passengers in 2014, posting growth of "only" 8.5% – the lowest growth rate in its history. In 2014 Spring carried only an additional 900,000 passengers, its lowest net additional volume after adding 590,000 passengers in 2008. Since 2009 Spring has added 1.25-1.5m annual additional passengers. 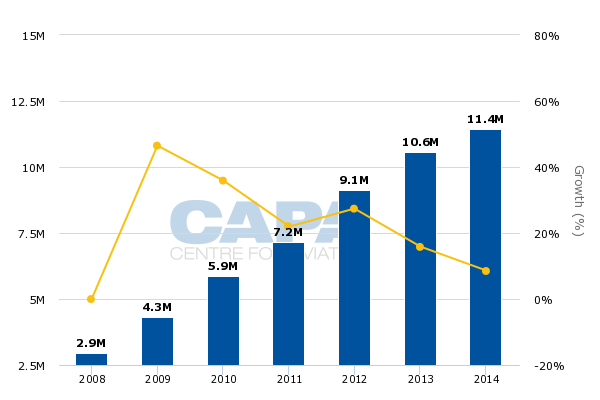 Traffic in 5M2015 is up 16% year-on-year. If Spring maintains this growth, it will end 2015 with 13m passengers. Of Spring's 11.45m passengers in 2014, 9.8m were in the domestic market and 1.65m in the regional/international market. This represents a share of 14% for international in 2014. 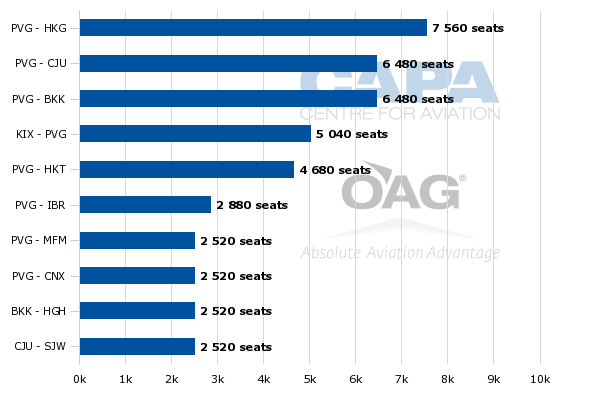 Spring plans to bring international's share of seats to 30% by the end-2015. OAG data indicates Spring is already at 25% in Jul-2015. The shift comes for a few reasons: the CAAC is encouraging airlines to fly abroad, airports may give preference to international flights for scarce slots, outbound demand is naturally occurring (there were over 100m outbound Chinese visitors in 2014 and a projected 500m within five years) and key short-haul markets like Japan that Spring can serve with narrowbody aircraft are seeing currency changes in favour of China. Spring also now feels emboldened. Having finally achieved its IPO earlier in 2015, it has management bandwidth to look at new growth markets but also feels it can achieve the growth. Although Spring's international flying is still short haul and with its existing fleet, the nature of the business is different enough. Accounting for 35% of Spring Airlines' international seats, Japan is the largest market for Spring Airlines. Spring serves seven Japanese points from 12 Chinese cities non-stop. Some of the flights operate over-night, allowing Spring to boost aircraft utilisation as China does not permit domestic red-eye flights. Spring Airlines and Osaka Kansai airport have a partnership that explains Spring's focus on Osaka Kansai. (The airport is the gateway to the popular Kyoto region.) Osaka Kansai especially benefits from duty free purchases, which tend to be higher from Chinese nationals than any other. Spring considers Osaka Kansai to be especially proactive (whereas Airports of Thailand is only starting to be, in Spring's view). Spring hopes a more proactive relationship with AOT will allow it to grow services to Thailand. Spring currently has 52 weekly flights to Kansai from nine Chinese cities (non-stop) but expects to grow this within five years to 100 weekly flights from 20 Chinese cities, all from Spring's China business and not potential future service from Spring Airlines Japan. This target may prove conservative; in Mar-2015 Spring linked Kansai to only four Chinese cities. Nagoya's four destinations may grow to eight in the short-term, according to Spring, which plans to grow the current 14 weekly flights to 28 in autumn 2015 and 42 by end-2015. Spring's schedule indicates where growth may occur: for example, Nagoya receives service from cities (Harbin, Hefei) that Osaka Kansai does not. Meanwhile, Japanese cities that only have service from Shanghai Pudong could see service added from other Chinese points. Spring's scheduling allows it to serve Japanese points from more Chinese cities since it has an effective base (a "mini-hub" as Spring calls it) at Osaka Kansai, where it overnights three aircraft. If Spring served Japan only from its Chinese bases, it would be limited in city pair combinations. But with a base in Kansai, Spring can fly from Kansai to Chongqing and back to Kansai, and then from Kansai to Qingdao or Xi'an and back to Kansai. Relying on Chinese bases may mean Spring could not serve Kansai from Chinese points where it does not have a base. This flying pattern is seen at other international focus cities: Spring bases one aircraft at Jeju, for example. The large number of Japanese destinations allows Spring to have this scheduling pattern that facilitates so many city pair combinations. This can be applicable to Korea and Thailand too. Spring counts Jeju and Osaka Kansai as hubs along with Chinese cities of Hangzhou and Shijiazhuang. There are for now only limited synergies with cross border joint venture Spring Airlines Japan, in which Spring Airlines (China) has a minority stake. Spring Airlines Japan's main goal is to fly from Tokyo to Chinese cities Spring Airlines where China cannot receive Chinese authority to do so. Spring Airlines Japan will also serve other international markets as well as, by necessity, the domestic Japanese market. Spring Airlines and Spring Airlines Japan have two ports in common: Saga and Takamatsu. Spring Airlines Japan serves those two cities from Tokyo Narita but Spring's website cannot sell non-tag connecting flights, and in any event the limited service between the city pairs means schedules do not align, and in some instances it is not possible to make a same day connection. Spring's share of the China-Japan market has grown from 2% in Jul-2014 to 7% in Jul-2015. Its growth comes as Chinese competitors grow in the market to new record highs. ANA is keeping capacity flat but as a result of Chinese airlines growing, ANA's market share will decrease from 24% in Jul-2014 to 18% in Jul-2015. JAL is shrinking by about 14%, and its market share will decrease from 15% to 10%. In line with growth in the market, Chinese visitors to Japan reached a record high of 2.4m in 2014. Chinese visitors to Japan in 5M2015 are up a remarkable 45%, following hiccups in earlier years, largely due to diplomatic reasons. Korea is Spring Airlines' third-largest international market, accounting for 17% of seats. But Spring's Shanghai Pudong-Jeju route is its second-largest (after Hong Kong) with 19 weekly flights. Jeju is Spring's only destination in Korea. Spring also has services to Jeju from Harbin, Shijiazhuang and Tianjin. Jeju, an island south of the Korean peninsula, is notable as it is visa free for Chinese nationals, making it an easy and popular destination. Thailand is Spring's second-largest market. Although Thailand is Asia's most popular tourism market, Spring expects Japan to be larger for it than Thailand. Spring serves three cities in Thailand: Bangkok, Chiang Mai and Phuket. The China-Thailand market is fragmented with fifth freedom operators (Sri Lankan), a number of Thai charter carriers and then local scheduled capacity, including from Thai AirAsia, which is targeting China. Spring serves Bangkok from its Shanghai Pudong hub as well as Chengdu, Hangzhou, Nanchang and Shijiazhuang. Chiang Mai, Krabi and Phuket are only served from Shanghai Pudong. And Spring Airlines' next 10 years: Tokyo Haneda, Seoul services, growing Spring Japan. Will long haul be part of the future? Spring's international network also includes Hong Kong, Macau, Taiwan and Cambodia (Siem Reap). The next development is four times weekly flights from Aug-2015 between Shanghai Pudong and Tokyo Haneda – Spring's first entry in Tokyo on its Chinese licence. Spring will use evening hour slots at Haneda, which means its service will return to Shanghai Pudong at 03:25 a.m., but demand for Tokyo should be able to make the service work. Spring joins Japanese LCC Peach Aviation in having low cost night flights at Tokyo Haneda, when the airport's slots are not fully utilised. Also launching Haneda service is Juneyao, full service but like Spring privately owned and based in Shanghai as well. Juneyao is launching with four weekly flights as well, and both presumably would like more frequency but await regulatory approval. Spring hopes regulatory changes will allow it to serve Seoul Incheon. Spring's only Korean destination at present is Jeju. As with Osaka Kansai, Spring could serve Seoul from multiple Chinese cities and have a base there. Spring sees its Jeju network rebounding from what has largely proven a short-lived crisis over the MERS outbreak in Korea. Its Kansai base will continue to grow while Nagoya is being made into a mini hub as well. Like Kansai, Nagoya is eager for LCC flights, especially international services. Nagoya is the presumed base for AirAsia Japan Mk II, expected to launch in 2016. Spring will also seek further synergies with its Japanese unit, but also grow it in its own right. Spring Airlines Japan is waiting on regulatory approval for Korean routes, which will bring much needed improvements to aircraft utilisation and overall financial performance at the Japanese unit. In Southeast Asia, one development that stands out is Spring looking to re-enter the Shanghai-Singapore market, after its first attempt failed due to problems with visas for Chinese, as the airline explains. Spring is largely flying where Chinese passengers want to go, and is learning about foreign markets and building international experience on the back of China's outbound travel demand. For all that Spring has achieved domestically, it sees itself – like other Chinese airlines – facing a learning curve on international flights. Spring following travel demand is somewhat of a change from other LCCs that build up new markets, effectively having the destination before passenger interest. But with the potential growth profile of Chinese travel, many things will be done differently in this market. By the end of 2015, Spring hopes to have its first interline in place as it grows a partnership network to include codeshares. Spring sees opportunities because of its position - it believes Chinese airlines are not giving international partners good rates for domestic connections. One foreign airline said a Chinese airline felt it could fill flights without connections from other airlines, so there was no pressing need to help partners. Spring has spent much of its first 10 years in something akin to a regulatory no man's land, neither shunned nor welcomed. That dynamic has changed to become a warm embrace. Spring has benefitted from that but undoubtedly wants more – further traffic rights and faster fleet growth, for example. The airline's next 10 years will likely be marked by greater penetration of the domestic market, but for many the most intriguing is the possibility of Spring launching long haul LCC flights. Given market trends among its Asian peers, there appears to be some inevitability in that, but Spring would likely start first with domestic widebody flights on congested routes and also regional Asian widebody services. Although there are no explicit widebody plans, Spring has shown it can adapt and move very quickly. As China welcomes more local LCCs, Spring's advantage will be its early start, agility and ultra low cost mindset. Those are often the missing factors that challenge and sometimes doom LCCs – and full service airlines.